You can work with a central, multi-user MS SQL database and safely and effectively run your projects in the local company network or via the internet. 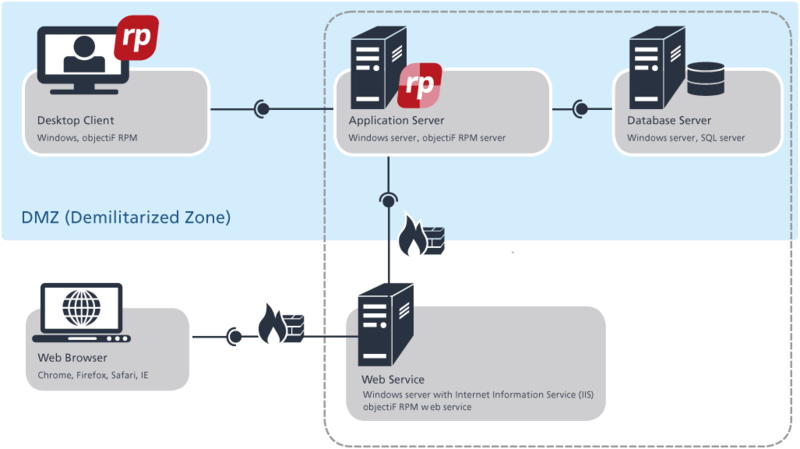 You can use objectiF RPM as a software as a service with a high level of cost transparency and flexibility. Or you can run objectiF RPM in your network on your computers. You can use objectiF RPM with a windows client or in a web client browser. This way you can retain access to all project data anytime and anywhere. The XMI format allows you to quickly import and export project data without errors and using integrated conflict recognition and conflict solution technology. Working with local or decentralized teams. And with additional staff members. And with internal or external stakeholders. The simplest scenario for using objectiF RPM is to work with one or more local teams. Everyone can access the central database in their local network using their windows clients. The access could also be granted via the web browser. The decentralized teams do not work with windows clients, instead they can access the central project data using their web browser. Because the user interfaces are almost identical, there is no difference for teams whether they use a windows client in a LAN or with a web browser via the internet. The team and the domain backlog as well as the team activities created for the team from the project plan are exported from the central project and imported to the local project team. The team plans its sprints locally and returns its data at specific times via the export/import tool. It is advised to create a central project for this scenario. The staff working in distant locations can access the project with a web browser. If teams need to talk to each other they can do so during a telephone call in which the participants can open results (folders with artefacts, diagrams, documents, backlogs etc.) in web browsers and/or with windows clients. If one of the participants makes changes these will become visible to everyone else. Generally it is useful to give internal stakeholders access to the results of requirements engineering. Because it is common for stakeholders to be spread around different locations it makes sense to give stakeholders access to their project via a web browser. The stakeholders need not install any software. All they need to do is identify themselves using their windows access information. There are often many stakeholders in large projects, so it makes sense to use a stakeholder analysis to identify the most appropriate stakeholders and concentrate on them. If you have external stakeholders who might not have access to your IT, for security reasons, then you need to generate documents from the results that you need to present to the stakeholders. You can use prepared document templates for this purpose. If needed, you can also link On-Premise and Software as a Service (Saas) in a common virtual private network (VPN) for maximal flexibility.